Abraham had at least eight sons, probably nine, since the Septuagint states that Eliezar was Abraham's son by a concubine named Masek. His first born son was probably born of his cousin wife Keturah and his name was Joktan or Yaqtan. The Y designates him as a divinely appointed ruler. Jews insist that Isaac was Abraham's firstborn son while Muslims insist that Ishmael was Abraham's firstborn son. However, the evidence of Scripture indicates that Yaqtan was the first in the birth order of Abraham's nine sons. He was likely born before Sarah conceived Isaac and it may have been his birth to Abraham's second wife, Keturah, that prompted Sarah's attempt to gain a son by Hagar as a surrogate. Hagar and Masek are to Abraham's household what the concubines Zilpah and Bilhah are to Jacob's household. If the biblical pattern is to be trusted, we may reasonably suspect that Hagar and Masek were the servants of Sarah and Keturah, just as Zilpah and Bilhah were the servants of Leah and Rachel (Gen. 30). That Masek was Keturah's servant is supported by the fact that the name Masek is still found among the south Arabian Mahra who dwell in Yemen, Oman and southern Saudi Arabia. The Elder Yaqtan is the founder of the Yaqtanite (Jokanite) Tribes of Arabia. His name is a version of the name Jonathan, meaning "God gives." He would have been a contemporary of Terah who lived about 2091-2016 BC. Abraham's son Yaqtan would have lived about 1987-1912 BC. Yaqtan is the son that ascended to the throne of his maternal grandfather, after whom he was named. This means that four of Abraham's ruling sons had names beginning with the letter Y: Yitzak (Isaac), Yishmael (Ishmael), Yaqtan, and Yishbak (another son by Keturah). In the Hebrew system, the Y was a lexeme that symbolized a solar cradle and the ruler's tent peg, as well as his clan. Each ruler had two main settlements, one ruled by this first wife, his half-sister, and the other ruled by his second wife, his cousin or niece. These were positioned on a north-south axis. The Sun passed over both at the same time. Before Hebrew emerged, the Y represented the sound of the letter H. This was true for most of the older North Arabian scripts: Taymanitic, Thamudic B and D, Hismaic, Safaitic and Hasaitic. In modern Hebrew the letter Y represents the sounds v,o,u. In biblical Hebrew the Y represents the sounds w,o,u, but the older North Arabian scripts had only the w sound and it was represented by a solar image, usually a sphere with one line or and X inside. This indicates that names beginning with the image of the Sun were given to high rulers who were regarded as deified sons. 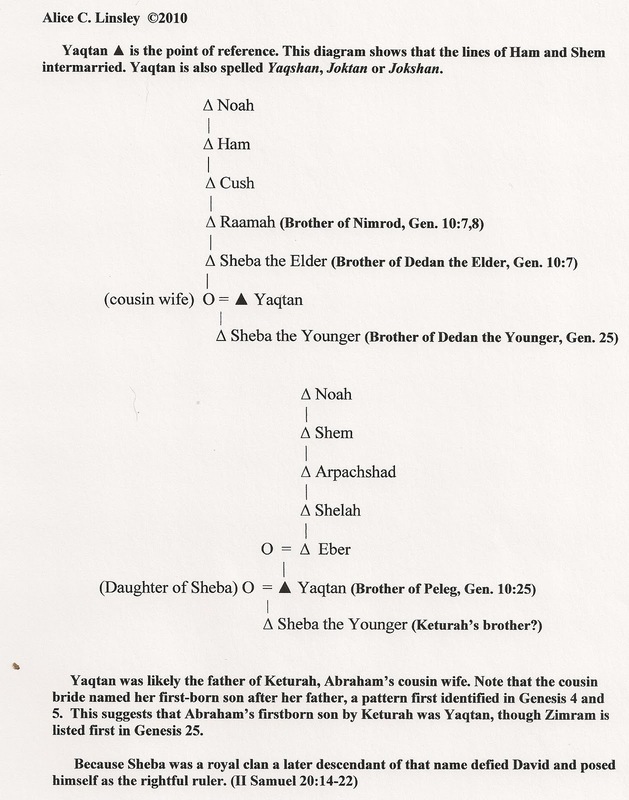 Here is a diagram of the Genesis Horim whose lines intermarried. 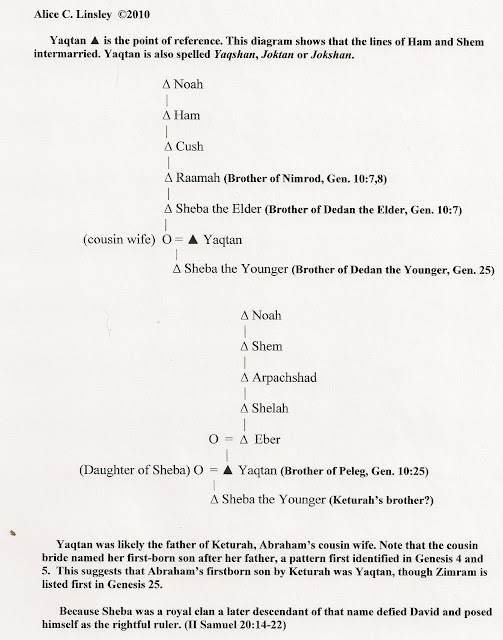 The diagram shows Yaqtan, Keturah's father, after whom she named Abraham's firstborn son. While Isaac ruled Abraham's territory between Hebron (Sarah's settlement) and Beersheba (Keturah's settlement), Yaqtan the Younger would have ruled over the territory of his maternal grandfather. Genesis 10:30 says that this territory stretched from Mesha, on the Gulf of Aqaba, all the way to the eastern mountain range of the Arabian Peninsula. Anglican woman vicar gives up her ministry to become Roman Catholic. Thanks, Savvy. She left in 2008. That makes at least 6 former women priests who have left Anglicanism. Three (myself included) went to Orthodoxy, and three (including Kroll) went to Roman Catholicism.